Franklin Matters: “You’ve got to regard education as a lifetime process"
“You’ve got to regard education as a lifetime process"
"For generations, the career path for smart kids around Detroit was to get an engineering or business degree and get hired by an automaker or parts supplier. If you worked hard and didn’t screw up, you had a job for life with enough money to raise a family, take vacations and buy a weekend cottage in northern Michigan. 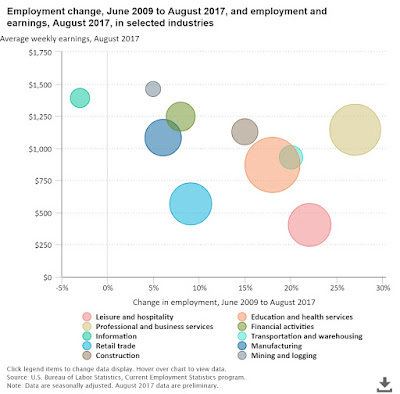 The cutbacks reflect a transformation underway in both the auto industry and the broader U.S. economy, with nearly every type of business becoming oriented toward computers, software and automation." This is not new. One can debate as to when this phenomenon started but I'd posit that it began in earnest with the great recession in 2007-2008. I was affected at that time in late 2008, one of 3,000 cast off by a giant in financial services. Note, the company is still a giant in financial services. The Bureau of Labor maintains the stats on unemployment and while the 'one' rate is easily quoted, there are other rates that are more insightful to showing what is happening with the work force.